It all started with our dog Cody. At the age of 3, one of our wonderful Maltese Bichons was diagnosed with intervertebral disc disease which left him paralyzed in his back legs. Back surgery was just the beginning of our fight for Cody’s health. During rehabilitation, we looked for a bed that was comfortable and would provide much-needed support. Thus, pet beds from Katherine Elizabeth Pet Products was born. The research, design and quality of our beds are wonderful to maintain and support the continued, optimal health of already healthy cats and dogs. They help disabled or aging pets to rest well every day and night. 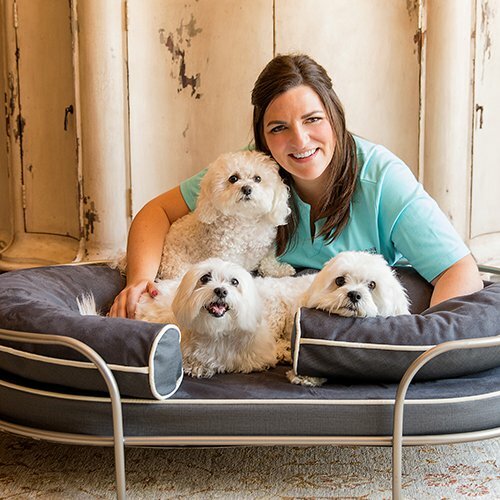 Owner, Designer of Katherine Elizabeth Pet Products with our two Maltese Bichons, Cody and Daisy, and Coton de Tulear, Tucker. The enveloping oval shape allows your pet to feel protected with easy entrance and exit. 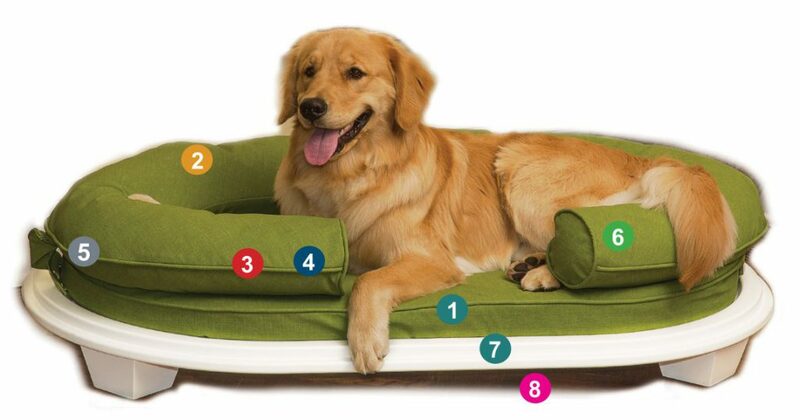 Bolster’s top is ergonomically curved to support your pet’s head and neck. “People quality” shredded Visco elastic filling in bolster, solid in cushion, provides orthopedic support. Cases are removable and washable. Snaps and straps lets the bolster and cushion be separated as a stand-alone bed. Bolster can be used on a bed, sofa or anywhere. Bolster and cushion flip for style and comfort. The furniture quality ottoman frame transforms the cushion into a quality decor piece. Our elevated design raises your pet off the floor, keeping them warm and cozy.